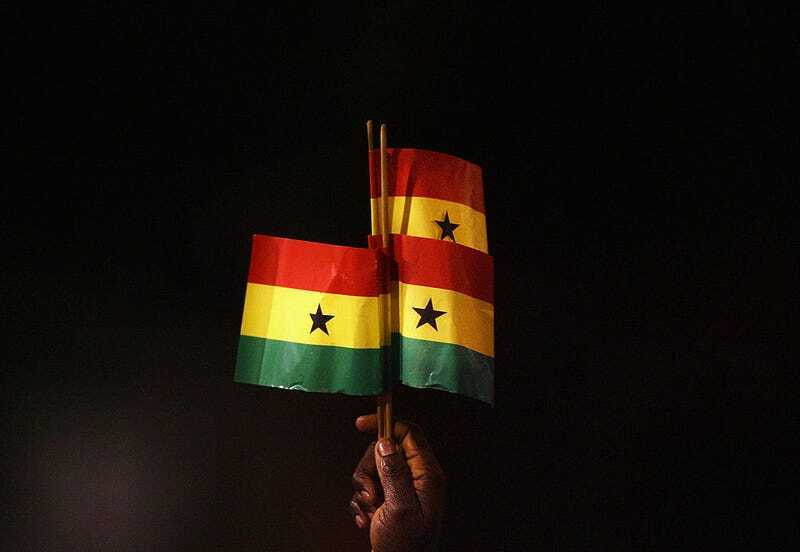 A Ghana fan holds up Ghanaian flags during an international soccer game. Colorism, which privileges lighter skin over darker, is an issue that not affects not only African Americans but pretty much all people of color around the world. From India to Brazil to Belize, one of the ways in which colorism rears its ugly head is in skin bleaching. We have all seen photos of celebrities such as Dominican baseball player Sammy Sosa and Nigerian-Cameroonian pop singer Dencia having bleached their beautiful brown skin to odd shades not found in nature, ostensibly for beauty and prestige. As far back as the 1990s, the Jamaican dancehall song “Dem a Bleach” talked about the phenomenon of using chemicals to alter the color of brown skin. But the West African nation of Ghana is putting the kibosh on that. Face 2 Face Africa reports that come August, Ghana’s Food and Drugs Authority will ban the sale of cosmetic products that contain the skin-bleaching ingredient hydroquinone, which has been linked to cancer. Presented as a physical (not mental) public health issue, authority spokesperson James Lartey confirmed that such products will no longer be imported into the country. “Concerning skin-lightening products, we are saying that from August 2016, all products containing hydroquinone will not be allowed into the country. From 2016, the acceptance for skin-lightening products is going to be zero,” said Lartey. The outlet reports that skin bleaching is a “norm” in Ghana and that Ghanaian boxer Bukom Banku said he underwent the process to gain a national assignment from President John Mahama as Ghana’s ambassador to Germany. The use of hydroquinone products is banned in the United States, Japan, Australia and the European Union. Read more at Face2Face Africa.